Endrast, a Bosmer sorcerer, was a local explorer of some renown who accompanied Sulla Trebatius on an expedition to the Alftand Dwemer ruins. 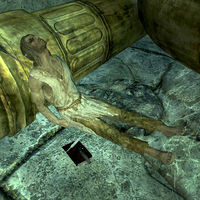 After they were captured by Falmer, he managed to pick the lock on their cell so they could escape. Despite initially being saved by Yag gra-Gortwog, he succumbed to his wounds beneath Dwarven steam pipes in the animonculory not long after writing his final thoughts in his journal, found nearby his corpse along with a piece of charcoal, and a lockpick. Endrast wears ragged robes with no shoes. He is mistakenly assigned Enthir's faction membership and packages. Due to the bug above, if Endrast is raised with a reanimation spell and then killed, it will trigger the Rejoining the College quest.